▶ SoldThis listing was sold on Nov 13, 2017 for the price shown here. Beautiful & open 3 BDRM, 3 BTH ranch home w/1900+ sq ft of living space & low maintenance backyard in quiet cul de sac in heart of Valley Park. Exterior feat covered porch, 2 car garage, vinyl siding, NEW ROOF (2017), motion detector lights in front & back of house, oversized patio & lux landscaping throughout. Meticulously maintained interior opens into open floor plan w/living rm & dining rm combo w/gleaming wood floors & sliders out to back patio. Beautiful kitchen w/granite countertops, breakfast bar, pantry & ceramic tile backsplash. Master bdrm has walk in closet & full bth. 2 add'l bdrms & full bth on main level. Finished lower level includes possible 4th bedroom or den, full bth & huge finished open area to include family rm and rec/media rm! Plenty of storage in lower level. 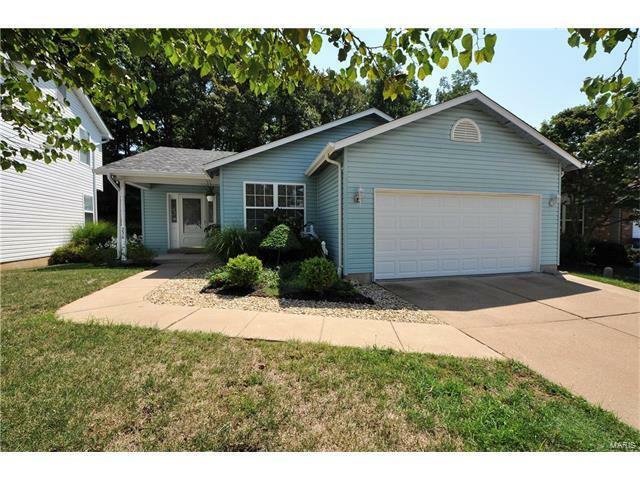 Hidden gem waiting for it's new owners with beautiful landscaping backing to trees/woods. TONS of natural light! Can't beat it! Make your appt to see today before it's gone! If showing from 3-7, take Big Bend to Dougherty Ferry to avoid 141 construction traffic!